About two years ago Microsoft® announced .NET Core, a framework that allows you to develop and run .NET applications natively on Linux and Mac systems. ASP.NET Core includes Kestrel, an internal web server library. As indicated in the documentation for Kestrel on the Microsoft website and the GitHub repository, you typically run Kestrel behind a production web server such as IIS or NGINX. In this tutorial, we’ll describe how to implement Kestrel behind NGINX and NGINX Plus. The .NET Core application deployment architecture is similar to the deployment architecture of Node.js or Go applications. NGINX provides .NET apps with traffic management features that simplify production deployment and scalability of the apps. You can run multiple .NET applications on the same or different machines, and NGINX or NGINX Plus performs load balancing and intelligent traffic routing between them. The following instructions explain how to quickly build a “Hello World” app using .NET Core, run it on Linux, and deploy it behind an NGINX or NGINX Plus reverse proxy with advanced traffic‑management functionality. Install .NET Core using the instructions on the Microsoft website. In our example we’re using Ubuntu 16.04. The following commands were correct at the time of writing, but are subject to change because Kestrel is still under development. Consult the .NET Core documentation as necessary. Install NGINX Plus if you want live activity monitoring, active health checks, or both. See the instructions in the NGINX Plus Admin Guide. To check that the app is working, run the dotnet run command. Edit the ./project.json file to add Kestrel as a dependency to the project. Copy this code for a simple app to a new file called Program.cs. It returns the current date and time, running Kestrel on port 5000 on localhost. At this point .NET Core is running on Linux and serving dynamic data using Kestrel as the HTTP server. With NGINX or NGINX Plus as a reverse proxy for the .NET application, you can easily configure security with SSL/TLS, HTTP/2 support, and many other features for fast application delivery on the same machine where the .NET Core application is running. The following instructions assume that NGINX and NGINX Plus are already installed on your system; if not, see Install .NET Core, NGINX, and NGINX Plus. For the purposes of quickly spinning up a sample .NET Core app with SSL, we’re generating a self‑signed certificate and associated key with this openssl command. We’re installing the certificate and key in the standard location for NGINX, /etc/nginx, but you can choose a different location. Configure reverse proxy in the default NGINX and NGINX Plus configuration file for HTTP virtual servers. For open source NGINX builds provided by nginx.org, and for NGINX Plus, the directory is /etc/nginx/conf.d, and the default file for HTTP virtual servers is default.conf. For open source NGINX builds distributed with Ubuntu, the directory is /etc/nginx/sites-enabled, and the default file for HTTP virtual servers is default. If you are not sure which is the default configuration file for HTTP virtual servers on your system, find the relevant include directive in /etc/nginx/nginx.conf. The first server block accepts HTTP requests on port 80 and redirects them to the virtual server for HTTPS requests. The upstream block defines the dotnet group of backend servers. In Run the Kestrel HTTP Server, we configured Kestrel on localhost:5000, meaning that it listens for both IPv4 and IPv6 traffic on that port. (Configuring Kestrel for just one protocol can cause instability and potentially 502 errors.) Similarly, NGINX and NGINX Plus resolve localhost to both its IPv4 and its IPv6 address (127.0.0.1 and ::1). For the sake of simplicity, here we identify the upstream server as 127.0.0.1 instead of localhost, so it listens for IPv4 traffic only. You can use localhost if you are comfortable with a more advanced configuration that includes IPv6. Note: If you see 502 Bad Gateway errors, it means that NGINX or NGINX Plus cannot connect to your .NET application. Make sure it’s running and serving responses on port 5000. If you have installed the nghttp2 package, you can also run the following nghttp command to test connectivity over HTTP/2. Look for the line highlighted in blue in the following example, near the beginning of the rather lengthy output. At this point we’ve finished the basic configuration of NGINX or NGINX Plus with .NET Core. NGINX or NGINX Plus is providing HTTP handling, passive health checks, security with SSL/TLS, and HTTP/2 connectivity for our .NET Core app. If you have installed NGINX Plus, you can configure two additional capabilities: live activity monitoring and active health checks. Add the following server block to the default NGINX configuration file for HTTP virtual servers. We strongly recommend that you restrict access to the statistics and metrics. Here we allow access only to users on localhost and a local network. For more information on live activity monitoring, see Live Activity Monitoring of NGINX Plus in 3 Simple Steps on our blog and the NGINX Plus Admin Guide. Active health checks guarantee that NGINX Plus sends traffic only to applications that are working correctly. You define the HTTP requests that NGINX Plus periodically sends to the app, and the type of response that the app must return to be considered healthy. For more NGINX configuration options, see the Microsoft documentation. For production‑ready deployments of the apps you develop with ASP.NET, NGINX and NGINX Plus provide the traffic‑management features you need in a reverse proxy. 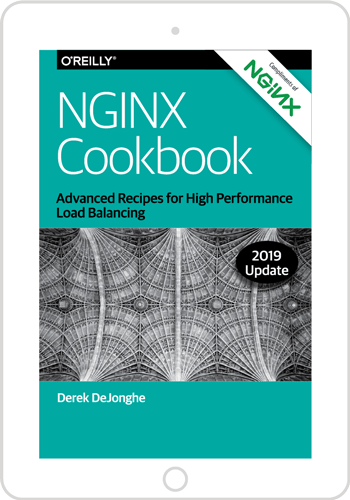 NGINX and NGINX Plus provide security, scalability, authentication, traffic limiting, and intelligent routing of your HTTP requests to .NET Core applications. To try NGINX Plus for yourself, start your free 30‑day trial today or contact us for a demo.